The InnovAntennas FMDX-9 uses one reflector, seven driven elements, and one director on a 4.1 m (161″) boom. I modeled the antenna with the AO 9.61 Antenna Optimizer program. This image shows the antenna geometry and segmentation detail. Blue dots mark segment boundaries. The red dot is the 75Ω feedpoint. Green dots mark loads for parasitic element mount capacitance. The lower phasing line extends to support the insulated parasitic elements. I did not model the support truss, which connects to the lower phasing line and is electrically active, as is the mast. Calculated performance is for 28 analysis segments per element halfwave, phasing line segment length equal to the line spacing, and parasitic element mount capacitance of 10 pF. 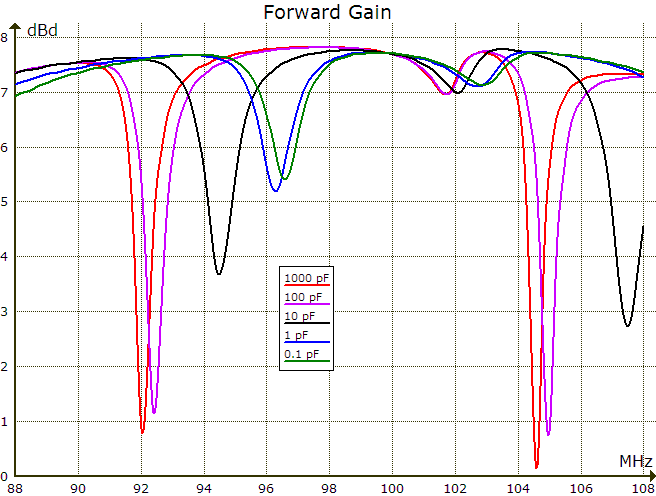 Forward gain includes mismatch and conductor losses. 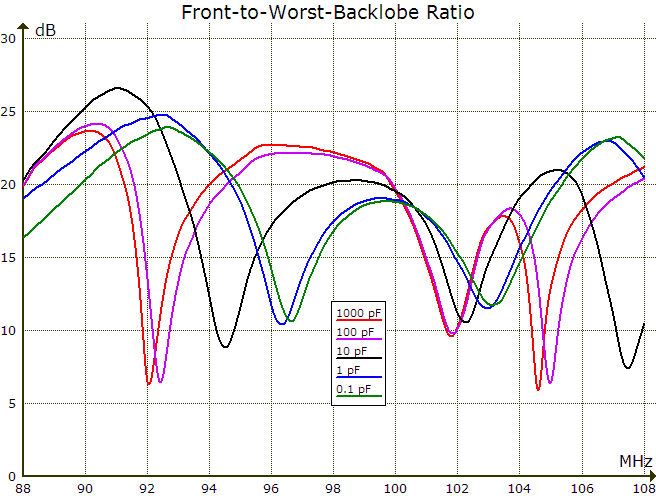 F/R is the ratio of forward power to that of the worst backlobe in the rear half-plane. This image shows the antenna current distribution for constant source voltage. Note the unequal current in adjacent phasing line conductors and in dipole halves, and the nonzero current in the phasing line extensions. The reflector and director mount to the lower phasing line extension with plastic bushings. These curves show the effect of mount capacitance over four orders of magnitude.